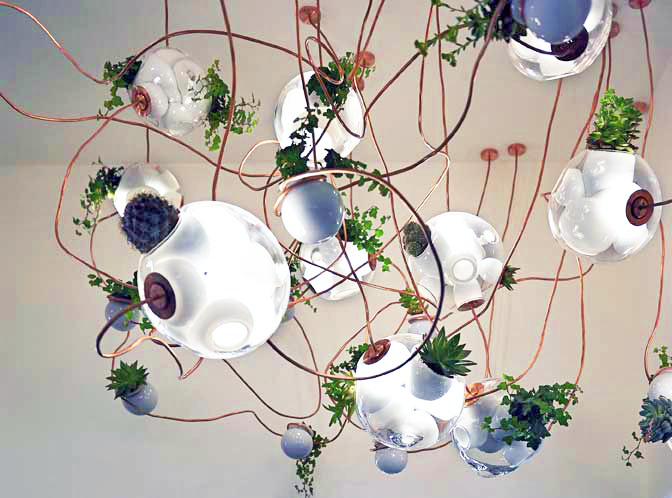 Omer Arbel‘s dazzling 38 Collection for Bocci features a series of suspended green lamps that double as planters. The surreal recycled glass spheres are blown with a multitude of cavities. Some spaces are deep enough to house LED lighting elements, some cavities host earth and succulents, and electricity and suspension are provided by a copper tubing system. At Euroluce during Milan Design Week Bocci told us that its lighting collections focus on the more emotional and irrational side of contemporary design through technical innovation, rigorous execution and a poetic approach. Based in Vancouver with a satellite company in Berlin, Bocci is a contemporary design and manufacturing house that works with a community of designers, architects, craftspeople and technicians that share an intimate connection to the Vancouver factory. Bocci’s 38 Collection is made from recycled glass, lit by energy-efficient LED lights, and shipped in recyclable packaging. Bocci’s sustainability principles also seek to encourage responsible consumerism by creating lighting collections that last a lifetime. 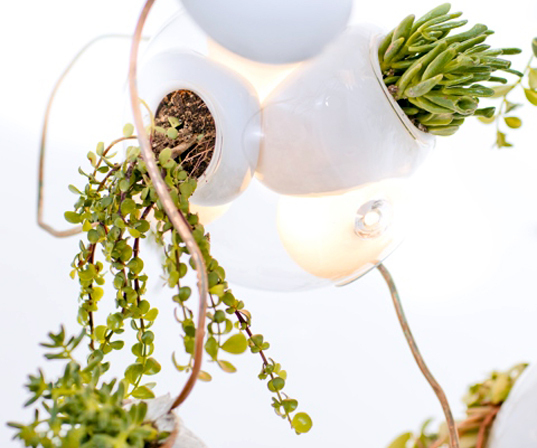 Omer Arbel's dazzling 38 Collection for Bocci features a series of suspended green lamps that double as planters. The surreal recycled glass spheres are blown with a multitude of cavities. Some spaces are deep enough to house LED lighting elements, some cavities host earth and succulents, and electricity and suspension are provided by a copper tubing system.